First, start by cleaning your tires before you clean the rest of your car. These are some of the dirtiest spots for most vehicles and you don't want dirty soap and water to spray over your freshly washed car. 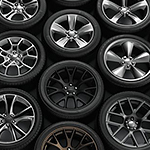 Select an appropriate cleaner and brush for the material on your wheels and follow the instructions. In most cases, you'll want to completely wash, rinse and dry one wheel or tire at a time before moving onto another one. This way you ensure that the dirty soap doesn't dry to the tire's surfaces. For more information on wheels, tires or other auto issues, stop by Prestige Family of Dealerships to talk with our professional team.